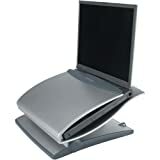 Poking around Amazon.com today, and saw this laptop desk by Kensington, which looks like a must-have for my home office. It holds your laptop, lets you flip the screen up so it serves as an eye-level monitor, while letting you attach a full-sized keyboard, mouse, etc. And it also has a built-in <span class=" />USB hub, which is also nice for all the USB accessories I’ve got attached to the computer. Definitely picking this up in the next few days. For $50, seems like a no-brainer. Rick, what laptop do you have?